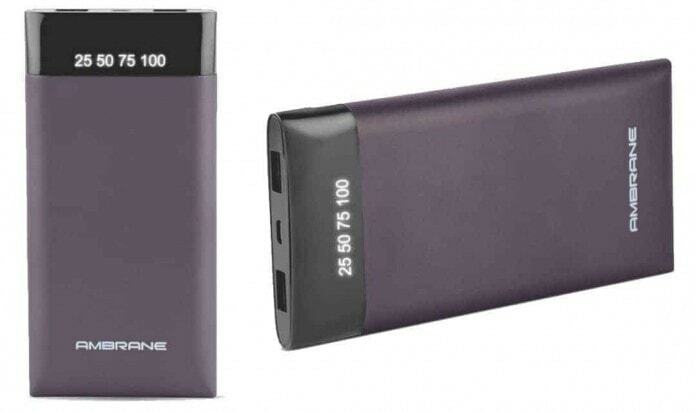 Ambrane, a very popular power bank brand in India has again expanded its portfolio with the launch o the new Ambran PP10 under the Plush Series, which has a capacity of 10000mAh and comes with advanced features. The Ambrane PP10 is priced at Rs. 2499 and it can charge multiple devices as there are two USB charging ports. As per the brand, it has a conversion rate of 80% and it can automatically adjust the power output based on the device plugged in. The power bank can withstand up to 500 power cycles in its lifetime. Also, the new Ambrane Plush PP10 has a clear Digital charging display that accurately displays the status of charge left in the power bank. The Ambrane PP10 comes with 9 layers of advanced chipset protection and quality polymer cell, and it is certified by BIS, as it comes with various safety features including Short Circuit Protection, Over-charge Protection, Over Discharge Protection & Over Voltage Protection. All these features ensure that the usage of the power bank is user-friendly and completely safe. It will be available in two color variants- Black and Grey, and now it’s available via retail stores in India. Previous articleHow do You Erase Photos from iPhone?